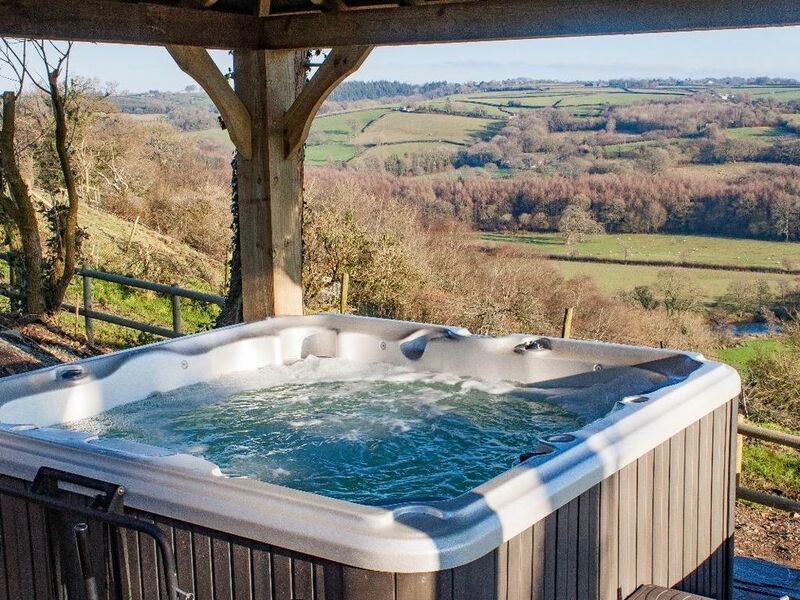 Little Silver Nugget is an annex cottage situated in the Umberleigh valley surrounded by stunning views. The property is all on one level and sleeps 2 adults in one double bedroom with an en-suite shower room. Open plan living and dining area with a cloakroom and kitchen with utility room. Outside is a patio area and side garden with off road parking for two cars, plus a private hot tub with stunning views. Ideal for walking and exploring in the Devonshire countryside. Little Silver Nugget is a romantic and blissful countryside paradise for two. Amenities: Heating. Electric range oven, microwave, fridge, freezer, Dolce Gusto coffee maker, dishwasher, tumble dryer, wine cooler, 32 TV, wireless bluetooth speaker/radio/cd player, WiFi. Fuel and power inc. in rent. Bed linen and towels inc. in rent. Cot and highchair available. Off road parking for 2 cars. Patio and side garden. Private woodland hot tub. Sorry no pets and no smoking. Shop 2 miles, pub 3 miles. Champagne, chocolates and strawberries for special celebrations can be arranged on arrival. Heating. Electric range oven, microwave, fridge, freezer, Dolce Gusto coffee maker, dishwasher, tumble dryer, wine cooler, 32” TV, wireless bluetooth speaker/radio/cd player, WiFi. Fuel and power inc. in rent. Bed linen and towels inc. in rent. Cot and highchair available. Off road parking for 2 cars. Patio and side garden. Private woodland hot tub. Sorry no pets and no smoking. Shop 2 miles, pub 3 miles. Champagne, chocolates and strawberries for special celebrations can be arranged on arrival.